James Anderson has been freed up by England to play a couple of County Championship games for Lancashire. The Burnley seamer will train with his county at Old Trafford, before potentially making his first domestic appearance of the season when Glen Chapple’s men host Somerset in Division One from Friday to next Monday. He is then also available to potentially face England new-ball partner Stuart Broad when Lancashire play Nottinghamshire at Trent Bridge from May 11th. Broad has been made available for three matches starting with Notts’ trip to Worcestershire at the weekend. “We know Jimmy loves playing for Lancashire, and having him back in contention will be a real boost,” said head coach Chapple. l It proved to be a bad day at the office for Lowerhouse in the Lancashire League as as Walsden won by 103 runs at the Brooks Foundation Ground. 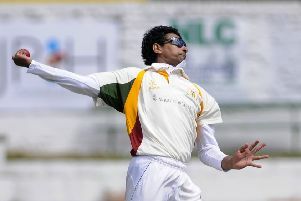 Professional Umesh Karunaratne gave the newcomers a push in the right direction when hitting an unbeaten 88 in the away side’s 230-7, and the Sri Lankan all-rounder applied the finishing touches with the ball. Josh Gale added to his side’s total when making 56, which included seven boundaries, while Joe Gale blew wind into the sails with a knock of 24 at number seven. Karunatane’s contribution with the bat included six fours and four sixes and then he took 3-44 to bowl the joint LCB Cup holders out for 127. Jamie Shackleton also took 3-25 and Joe Gale 3-22. Lowerhouse lost wickets at regular intervals as they failed to gather any momentum with former skipper Charlie Cottam top-scoring with 22. Paddy Martin also made 20 for the hosts. Elsewhere, Burnley were beaten by six wickets against Todmorden at Centre Vale. Ben Pearson’s 95, coupled with professional Chris Schofield’s 67, put the home side in a commanding position as they closed the innings on 196-4. Paid man Schofield then got the ball rolling in Todmorden’s defence when taking 3-31, while former Burnley bowler Graham Lalor took 2-31 against his old club. Bilal Abbas then added 2-42 as the visitors were restricted to a finish of 135. On Sunday, Burnley travel to Chatburn Road to face reigning champions Clitheroe. Lowerhouse are again at home to league newcomers in Middleton.